Mary Teaches Us How to Read the Bible. The Memorial of the Immaculate Heart of the Blessed Virgin Mary. The Twelfth Saturday of Ordinary Time. 2:33 PM 6/28/2014 — “Well may I rejoice in the Lord, well may this heart triumph in my God” (Isaiah 61:10). Those are the words of Isaiah the Prophet which we just heard in our first lesson, which I just repeated for you in Msgr. Knox's excellent translation. There is, of course, no way to know what was in the mind of the Prophet when he wrote those words, but we do know what was in the mind of God when he inspired the Prophet to write them: the Heart of which he speaks is the Heart of God's Mother, and we do rejoice in it because, in that Heart, is found the triumph of God. Today is a special day for us here at the Shrine, as it's the feast of the Immaculate Heart of Mary. In fact, some of you may remember that this Shrine was originally named The National Blue Army Shrine of the Immaculate Heart of Mary. That was later changed to reflect the fact that our purpose here is to promote and spread the messages of the Blessed Virgin at Fatima; so, our official title now is The National Blue Army Shrine of Our Lady of Fatima Dedicated to the Immaculate Heart of Mary. That being said, we should acknowledge that today's feast is not as historical as the feast of the Sacred Heart of Jesus which precedes it. Devotion to Our Lady under the title of Her Immaculate Heart was first preached by St. John Eudes in the seventeenth Century. He, of course, was the holy priest who founded the community known in France as the Eudist Fathers, what most of us refer to as the Congregation of the Sacred Hearts of Jesus and Mary. 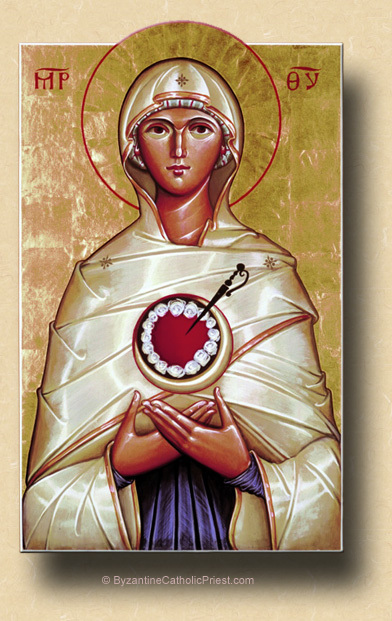 Initially, he founded his society of priests to preach devotion to the Sacred Heart of Jesus, but soon realized that it was impossible to talk about the Sacred Heart without also speaking of Mary's Immaculate Heart, for it is impossible to worship one without venerating the other. We, of course, know this instinctively: one cannot love the Son without loving the Mother, and one cannot love the Mother without loving the Son. Those of us to love the Blessed Mother of God, and who find Her truest beauty in the contemplation of Her Immaculate Heart, owe the greatest debt of gratitude to St. John Eudes for being the first to promote this devotion; but, we must also give a tip of the hat to our late Holy Father, Pius XII, who, in 1942, inspired by the life and preaching of St. John Eudes, consecrated the world to the Immaculate Heart of Mary, and who established this feast for us to celebrate. It is not insignificant that today's Gospel lesson presents to us the first recorded words of Our Lord in the Gospels: “I must be about my Father's business” (Luke 2:49). Certainly, He must have spoken before this, but these words are the first recorded for us. And the response of the Mother of God to these striking words, the first words we hear spoken by our Lord, is not to speak, but simply to keep “all these things carefully in her heart” (2:51). The text of the Vulgate reads: “Et mater ejus conservabat omnia verba hæc in corde suo—And his mother preserved all these words in her heart.” It doesn't mean simply that She remembered them;—it doesn't say She kept all these words in Her mind—it says She preserved them in Her Heart. When you keep something in mind, it means nothing more than that you remember it; it might be something good, it might be something bad. But when you keep something in your heart, it means you cherish it and nurture it; you water it and tend it like a farmer waters and tends a seed; you allow it to grow within you and feed your interior life; it finds a place in your prayers, and effects your resolutions. And by responding this way to the very first words spoken by our Blessed Lord in the Gospel, the Immaculate Heart of Mary sets the pattern for us, and teaches us our very first lesson in how to read the Bible: we don't analyze the words of our Lord, we don't pick them apart and look for various meanings, we don't look for some creative way to pretend that our Lord is saying something we want Him to say or not saying something we don't want Him to say; we simply preserve them in our hearts, we make them part of our prayer, and thereby make them the foundation of our lives. “Exsultavit cor meum in Domino, salvatore meo.” Our Responsorial Psalm today isn't really a psalm at all, it's from First Samuel: “My heart exults in the Lord, my Savior” (I Sam. 2:1). In addition to all the intentions we bring to Holy Mass on this feast of Mary's Immaculate Heart—intentions for our country, for our families, for the triumph Her Immaculate Heart throughout the world—let us also bring the intention that we might follow the lead of the Mother of God in learning how to more perfectly follow Her Son, and, like Her, cherish His words in our hearts. * Ordinarily, the Memorials of both the Immaculate Heart and St. Irenaeus are obligatory; but, since both fall this year on the same day (the feast of the Immaculate Heart always being on the Saturday following the Second Sunday after Pentecost), they are made optional so that one can choose between them. A ferial day could also be observed.